Heat oven to 375°F. In 12-inch nonstick skillet, heat oil over medium-high heat until hot; cook bell peppers, onion and grill seasoning in oil 8 to 10 minutes, stirring frequently, until peppers and onions are soft. Slice sheet of dinner rolls in half horizontally; place bottom half in ungreased 13x9-inch (3-quart) baking dish. Place 2 meatballs on each roll bottom. Spoon peppers and onions over meatballs. Top with sliced cheeses. Place top half of rolls over cheese. Brush melted butter over top of rolls. Bake 19 to 22 minutes or until rolls are golden brown and cheese is melted. 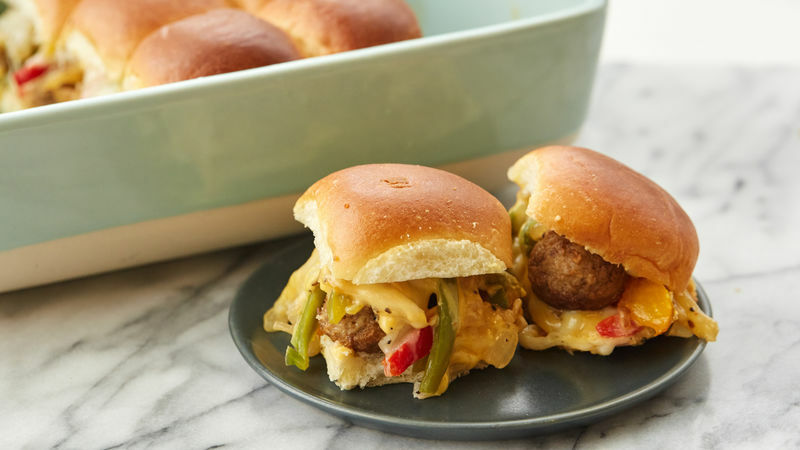 Cut into individual sliders, and serve. Sliced deli American cheese can be substituted for Kraft™ Velveeta™ cheese.